(by Agence France-Presse) – The United States urged Venezuela’s military Monday to accept a “peaceful” transfer of power as it ramped up the pressure on embattled leader Nicolas Maduro with a raft of sanctions on state oil company PDVSA (Petróleos de Venezuela). President Donald Trump has recognized opposition leader Juan Guaido as Venezuela’s interim president, sparking a standoff with Maduro who until now has retained the crucial backing of military leaders in Caracas. 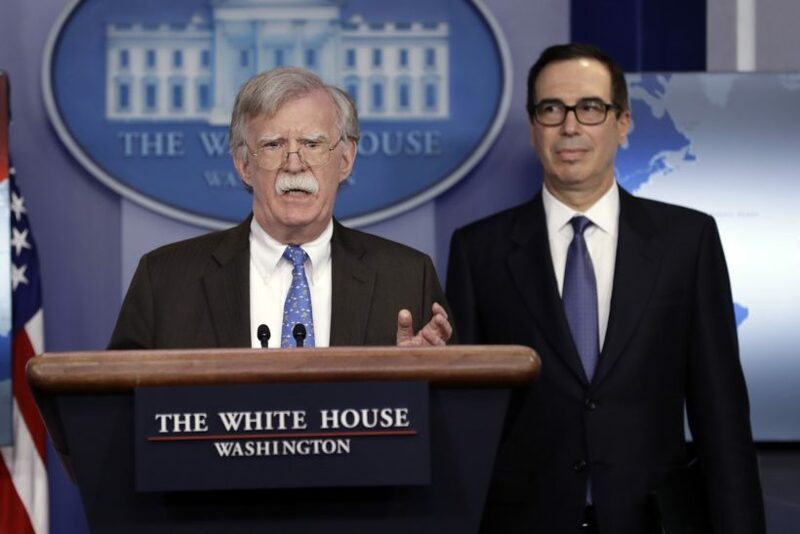 Treasury Secretary Steven Mnuchin told reporters at the White House that new sanctions would prevent Maduro from diverting more resources from the crisis-wracked country until control in Caracas could be transferred to an interim or new democratically-elected government. 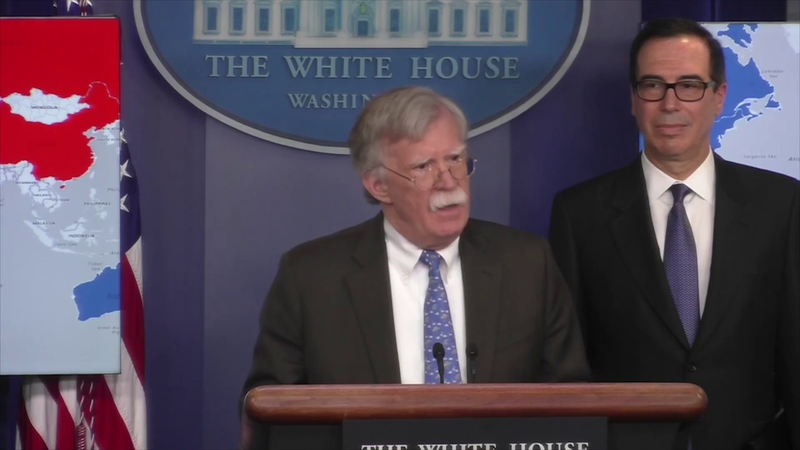 Ratcheting up the pressure, National Security Advisor John Bolton appealed directly to the military which has been essential to keeping Maduro in power since 2013. “To a certain extent, this has begun,” he said. “We’ve seen Venezuelan official and military personnel heeding this call,” he added, citing the example of the country’s military attache to Washington who broke ranks with Maduro at the weekend. Washington “is holding accountable those responsible for Venezuela’s tragic decline,” Mnuchin told reporters. “We call on our allies and partners to join the United States in recognizing interim president Guaido and blocking Maduro from being able to access funds,” he said. Mnuchin added however that PDVSA’s US-based subsidiary Citgo would be able to continue operations, as long as its earnings were deposited into a blocked account in the United States. The latest sanctions on PDVSA, which has been a “vehicle for corruption… will help prevent further diverting of Venezuela’s assets by Maduro and preserve these assets for the people of Venezuela,” Mnuchin said. The United States will issue temporary licenses to ensure US, Caribbean and European refineries that rely on Venezuelan crude can keep buying PDVSA oil, Mnuchin said, although he added that many had been taking steps to find other sources. Published at AFP .com on January 28. Reprinted here for educational purposes only. May not be reproduced on other websites without permission from Agence France-Presse. b) Why is the Trump administration urging the Venezuelan military to accept a peaceful transfer of power to opposition leader Juan Guaido? c) Why is the U.S. imposing sanctions on Venezuela’s state-run (government owned) oil company PDVSA? Be specific. d) What is the U.S. calling on our allies and partners to do? e) What exemptions is the U.S. making regarding Venezuela’s oil? 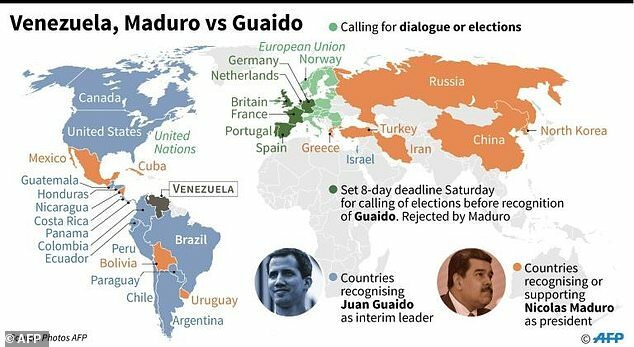 How long do you think it will take the military to pull their support for socialist President Maduro and transition Guaido into power as the interim president until legitimate elections can be conducted? How important a role will the Trump administration have played in helping the people of Venezuela restore their government and economy? (Do you think the governments of South America and the EU and Canada would have forced Maduro to leave without U.S. involvement? Explain your answers.